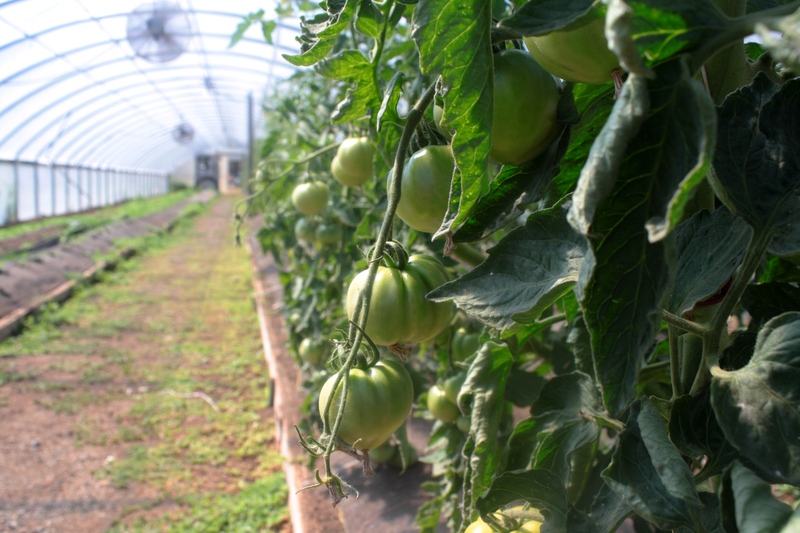 Tomatoes grow inside a greenhouse on the Growing Veterans farm. Photo credit: Matt Benoit. Joel Swenson never thought about being a farmer. But that was before the 34-year-old former combat medic joined “Growing Veterans,” a local, nonprofit agriculture program empowering military veterans to grow food, communities and each other. After four years with the program, Swenson – now the farm’s manager – can’t imagine doing anything else. 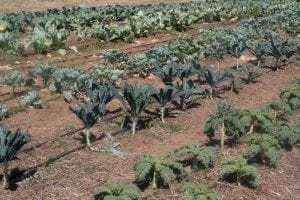 On a 2.5-acre farm just north of Laurel, off the Guide Meridian, the program’s veteran volunteers and interns grow numerous types of produce: broccoli, cauliflower, Brussels sprouts, lettuce, garlic, seasonal squash, cucumbers, tomatoes, peppers, zucchinis and hops. They also harvest honey from their own bees. In winter, the focus shifts to greenhouse projects. Produce is then sold at local markets and to local businesses like Semiahmoo Resort, which has a close working relationship with the farm. Farm manager Joel Swenson inside his farm site office. A former airborne combat medic in Afghanistan, Swenson credits the farm with helping him stop drinking in order to realize his passion for agriculture. Photo credit: Matt Benoit. It started in 2013, when veteran and Western Washington University student Christopher Brown began gardening at the advice of his father. Brown found gardening gave him a renewed sense of purpose and helped his post-service anxiety. Soon after, he and co-founder Christina Wolf took over the former Bellingham Food Bank farm site, and Growing Veterans was born. In 2015, the program received official 501(c)(3) nonprofit status, and also gained organic certification. “He was always trying to get me out here,” Swenson says of Brown, whom he met at the WWU veterans’ support office. When Swenson finally visited the farm, he says it was shoveling poop with a fellow veteran that made him realize how therapeutic agriculture could be. Swenson believes the therapeutic effect also stems from having to take care of something other than one’s self, whether it’s a person, animal or plant. 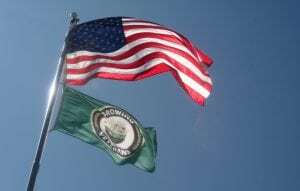 The American and Growing Veterans flags fly high and proud on the nonprofit’s 2.5-acre farm. Photo credit: Matt Benoit. “There’s just something about it that focuses your energy on keeping that alive and thriving,” he says. Swenson grew up in Sedro-Woolley and joined the Army in 2007. In January 2009, he deployed to Afghanistan as a platoon medic. Swenson took part in numerous missions during his year in-country, to include the search for Bowe Bergdahl. Many of those deployed risked their lives on a daily basis, including Swenson. When he finally came home to Whatcom County in 2011, he had difficulty readjusting to a civilian life. Swenson began leading an unhealthy lifestyle, which only exacerbated his PTSD symptoms. Upon returning home, he had trouble with routine and everyday tasks. Due to Swenson’s unhealthy coping strategies post-combat, Swenson’s health began to deteriorate. Anyone can volunteer to work the fertile soils of the Growing Veterans farm, whether they’re a veteran or not. They’re always looking for more help. Photo credit: Matt Benoit. Sadly, downhill spirals are common for veterans struggling to readjust to life outside the military. Swenson says statistics show in the U.S. alone, 22 veterans a day commit suicide, in one form or another, by abusing alcohol and prescription medications. Growing Veterans, he says, is like an alternative, holistic approach to helping vets handle post-service transitions. One reason the farm works so well is that agriculture’s disciplined structure and teamwork can be similar to what veterans found in the military. Swenson says beekeeping, in particular, helped him and other veterans due to the parallels between hive-mind and military service. When Swenson began counseling for PTSD, working with bees helped him practice grounding techniques for anxiety. Controlling one’s breathing while working on the hives prevents bees from becoming more aggressive, a perfect chance to practice being calm in stressful situations. Swenson has since used those techniques more easily in off-farm situations. Growing Veterans does more than just provide therapeutic diversions. It allows veterans to form a multi-generational network of peer support, fostering a sense of belonging and the inspiration to make positive changes in their lives. Swenson credits Growing Veterans with his decision to stop drinking two years ago, and sharing his story has helped others along the way. During his first year of volunteering, KING-5 News interviewed him for a live segment about Growing Veterans. A week later, while attending a produce event at a VA Hospital, a Vietnam veteran approached him. The man told Swenson he’d struggled with issues since Vietnam, but never sought help. Seeing Swenson on TV, he said, made him finally take action. Growing Veterans also helps give veterans the knowledge to take advantage of resources they may not otherwise have been aware of. For example, Swenson bought his first home last year, in part because of being around veterans who’d already been through the VA’s home loan process. Paid internships are also available for veterans at the farm through a Veteran Conservation Corps internship. It lasts from three to six months and will be open in spring 2019. In addition to veterans, the farm is also open to non-veterans. Anyone interested in sustainable agriculture, or those needing internship or volunteer hours, can take part. “I feel it’s vital for vets to work with non-vets, to break down those barriers that both sides have with each other,” Swenson says. 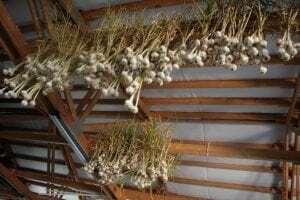 Bulbs of garlic hang from the ceiling of the Growing Veterans farm building. The farm grows a variety of produce for sale to both individuals and local businesses. Photo credit: Matt Benoit. Swenson says the farm is always in need of more volunteers and donations. A handful of veterans who’ve taken part in Growing Veterans often go on to work in other sustainable and organic agricultural sectors. 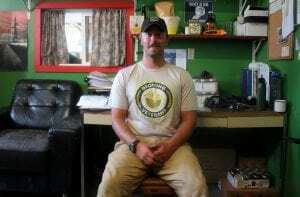 Some even start their own farms, helped by Growing Veterans’ partnership with the Farmer Veteran Coalition. The FVC helps vets acquire land, equipment and grants for them to get started. Growing Veterans also partners with the Lynden VFW 9301, which recently built them a roadside stand to sell produce on Hannegan Road. Growing Veterans Interns and VFW members help run the stand Thursday and Friday from 2:00 p.m. – 6:00 p.m.
Swenson says, “It just takes one time to come out here,” he says. “That’s what it took for me, and I’m still here.” Swenson looks forward to waking up with the sun, and ensuring both the farm’s plants and veterans are getting the help they need.